Who’s your best of the best? High school football in Texas is known for oversized linemen and large crowds stuffed into big regional stadiums. Florida is where college recruiters go to find speed. And Ohio has its legendary schools Massillon, Archbishop Moeller, St. Ignatius and St. Xavier. San Diego high schools, however, are where you go to find future Heisman Trophy winners, Pro Football Hall of Famers, All-Pros and more than 100 Super Bowl participants. San Diego has produced four Heisman Trophy winners — Reggie Bush, Rashaan Salaam, Ricky Williams and Marcus Allen. And three Hall of Famers — Allen, Junior Seau and Terrell Davis. It was those names and numbers that got us thinking. Who are the best prep players ever in San Diego? And not just the top 100, but the top 10 at each position. Are there enough players to fill out an offensive line? Are there enough defensive linemen, tight ends? The answer was a resounding — YES!!! So every Saturday during the prep football season, we’ll present the best 10 players by position, starting when the California Interscholastic Federation’s San Diego Section split from the Southern Section in 1960. We’ll start with drop-back quarterbacks and work our way through multi-dimensional quarterbacks, defensive linemen, offensive linemen, tight ends, linebackers, receivers, cornerbacks, safeties, running backs, fullbacks, place-kickers/punters and athletes. We’ll finish with the best 10 players prior to 1960 and finally the best 10 players ever. This was a labor of love. I’ve been following prep football in San Diego since 1969. And while I have final say on the final 10 at each position, I got tremendous input from media veterans Terry Monahan, John Kentera, Steve Brand and Rick Smith and San Diego Section Commissioner Jerry Schniepp. You’d think some of the positions would be easy, but we struggled to narrow the offensive line down to 10. Choosing only 10 defensive linemen was tough. And we knew we’d have a hard time narrowing the field at quarterback, running back, receiver and the defensive secondary. Monahan, Kentera and I took everyone’s recommendations, then spent four hours at lunch, narrowing things down. I spent several more hours researching each player to make sure I was comfortable with the selections. In other words, what a player did in high school counted 50 percent. What he did after high school — college and pros (both NFL, CFL and Arena League) — was the other 50 percent. Some of the best young players like Rancho Bernardo kicker Matt Araiza, Mt. Carmel/Georgia Tech quarterback Lucas Johnson, La Jolla Country Day/Oregon quarterback Braxton Burmeister, Grossmont/USD quarterback Anthony Lawrence, La Costa Canyon/San Jose State/NFL Texans offensive lineman David Quessenberry, Mission Hills/BYU linebacker Fred Warner, Parker/Yale athlete Deon Randall didn’t have enough secondary credentials to make the list at this time. Additionally, players like Hoover/Oregon receiver Todd Doxey, who tragically drowned before he could play for the Ducks, didn’t make it despite having great high school credentials. I think we got this right — or are at least pretty darn close. But we certainly invite public comment. Let us know if we scored a touchdown or failed on fourth-and-inches. We left some awfully good players off the lists. Several times, we struggled with the last few spots. Tony Banks, Hoover: Threw for 4,129 yards at Michigan State. Passed for 15,345 yards in eight NFL seasons and 96 games. Matt Kofler, Patrick Henry: Threw for 4,476 yards at San Diego State. Passed for 1,156 yards in five years in NFL. Ryan Lindley, El Capitan: 2006 section Player of Year. Threw for 12,690 yards and 90 TDs at San Diego State and 1,372 in three NFL seasons. Jim Plum, Helix: 1980 and 1981 section Player of Year. Parade All-American. Threw for 1,533 yards at San Diego State. NFL and CFL camps. Joe Roth, Granite Hills: All-American, Heisman Trophy candidate at Cal, throwing for 3,669 yards in two seasons. Died of cancer before NFL Draft. Sean Salisbury, Orange Glen: 1979 section Player of Year. Threw for 4,481 yards at USC and 9,439 in seven pro seasons, including CFL Grey Cup title in 1988. Brian Sipe, Grossmont: 1966 section Player of Year. All-American at San Diego State, throwing for 5,707 yards in three seasons. Two-time All-Pro. 1980 NFL MVP. Threw for 23,713 in 125 pro games. Akili Smith, Lincoln: Pac-10 Player of the Year at Oregon. Third pick in NFL Draft in 1999. Played four years in NFL and briefly in CFL. Alex Smith, Helix: 25-1 as Helix’s starter. All American at Utah, throwing for 5,203 yards. First overall NFL pick. Has played in 141 NFL games with 27,846 passing yards and 157 TDs. Two Pro Bowls. 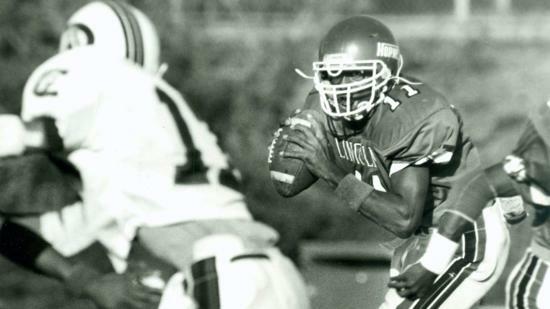 Dan White, Point Loma: Led Arizona to Fiesta Bowl win in 1994 and had 40 career TDs. Played briefly in NFL, CFL and Arena League. Wayne Sevier, Sweetwater: Led San Diego State to conference title in ’62. Longtime NFL assistant coach.